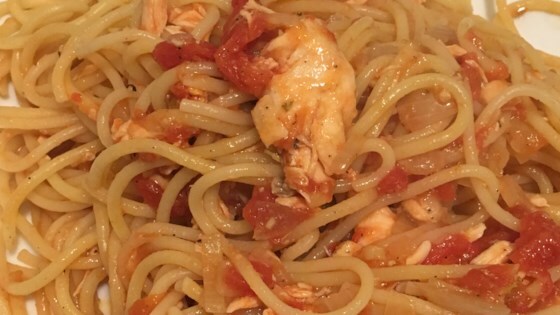 "Use salmon, tilapia, or cod in this easy Pinoy recipe that has a tomato-based sauce with onion and garlic. Serve with rice." Season both sides of the salmon steaks with salt and pepper. Heat 2 tablespoons cooking oil in a skillet over medium heat. Briefly fry the salmon in hot oil until lightly cooked, about 2 minutes per side. Remove from skillet and set aside. Add 1 tablespoon cooking oil to the skillet and allow to get hot before adding the onion and garlic; cook and stir the onion and garlic in the hot oil until fragrant, about 5 minutes. Stir the diced tomatoes into the mixture and season with salt and pepper. Continue cooking until the moisture from the tomatoes makes a sauce, about 5 minutes more. Return the salmon to the skillet and allow to simmer in the sauce until the fish flakes easily with a fork, about 10 minutes. Stir the beaten egg into the sauce and stir until well integrated; serve hot. Loved it. Full of flavor. We left the salmon whole, so stirred in the eggs before putting the salmon back in. So delicious and more hearty than most salmon dishes.